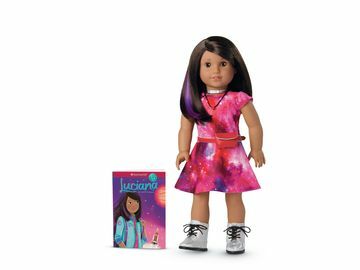 American Girl's 2014 Girl of the Year® Shines in New Movie American Girl: Isabelle Dances into the Spotlight™ | Mattel Inc.
"A celebration of dance, family, and friendship that every girl will love." MIDDLETON, Wis.--(BUSINESS WIRE)-- On July 22, American Girl's 2014 Girl of the Year Isabelle Palmer™ dances her way into the hearts of girls everywhere in a new feature-length movie from Universal Studios Home Entertainment. American Girl: Isabelle Dances Into the Spotlight is available today on Blu-ray™ Combo Pack and DVD, and on DIGITAL HD. Starring Melora Hardin from "The Office" and Hannah Montana: The Movie, and presenting Erin Pitt from Against the Wild as Isabelle, the movie tells the story of a talented nine-year-old girl who is an inspired dancer with a flair for design. When Isabelle starts attending the Anna Hart School of the Arts, she has a hard time getting her proper footing—both in her transition to a new school and in the dance studio. To complicate the situation, her older sister, Jade, is the star ballerina at the school, and a rival classmate tries to make Isabelle feel as if she doesn't belong there. Isabelle struggles with self-doubt, but when she stops comparing herself to others and learns to focus on her own unique talents, she finds a special way to stand out and to use her passions to help others, too. Isabelle fans can visit americangirl.com/girloftheyear for a behind-the-scenes look at the new film, including the movie trailer and video clips, character bios, the "Isabelle's Dance Jam" video featuring girls performing an original dance inspired by the movie, games, crafts, movie-related events, and more. In addition to the movie, American Girl is debuting several new Isabelle-related products this summer, including the Isabelle Dances Into the Spotlight movie soundtrack CD, Isabelle's Sparkle Dress, Isabelle's Makeup Set, and Isabelle's Fashion Sketchbook. 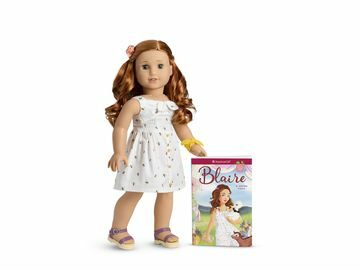 The new products are available through American Girl's catalogue (1-800-845-0005), at americangirl.com, and at all American Girl retail locations nationwide.